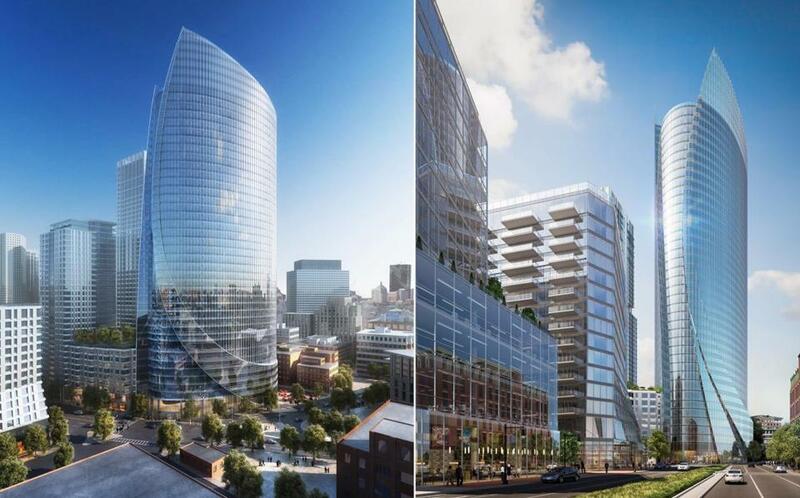 Renderings of the new One Congress Street office tower. State Street Corp. is relocating its headquarters in a blockbuster deal that will launch construction of a new office tower near City Hall and pave the way for the demolition of much of the hulking Government Center Garage, which has spanned Congress Street for decades. State Street will occupy the bottom half of a 1 million-square-foot tower that HYM Investment Group is developing at One Congress St. The financial services giant has signed a 15-year lease for 510,000 square feet in the 43-story tower and will move from its current home by South Station around the time its lease there expires in 2023. At least 2,500 headquarters employees are expected to make the move to One Congress. “We wanted something that was going to continue to signify our commitment to Boston, that would be a visible commitment to Boston,” chief executive Ron O’Hanley said. Developers and landlords had aggressively courted State Street over the past year or so after it became clear that the company was considering leaving its home at One Lincoln, also known as the State Street Financial Center. That tower, now owned by Fortis Property Group, was new when State Street first moved in, 16 years ago. State Street leases much more space in One Lincoln than it currently needs and subleases about 200,000 square feet to other tenants. O’Hanley said State Street considered staying put at One Lincoln. But the interior layout isn’t ideally configured for the open-office concept that executives want, he said. Cost was a factor, too. One Congress, O’Hanley said, was priced substantially less than other proposals that developers and property owners presented to the company. State Street remains under pressure from shareholders to contain expenses; just last week, O’Hanley announced some 1,500 job cuts from high-cost locations around the world. State Street also has two other major offices in Boston. The lease for its Fort Point center doesn’t expire until 2030. But a smaller lease at 100 Summer St., around the corner from the headquarters, comes up for renewal around the same time as the One Lincoln space. The deal with HYM includes signage rights for State Street. The company’s name sat atop 225 Franklin, a previous headquarters, for nearly 40 years. And it had a logo atop One Lincoln in 2005 after it moved there. The Walsh administration is more willing to accommodate corporate names on office towers than previous mayoral administrations, with some parameters attached. The Boston Planning & Development Agency still needs to approve any tower sign. HYM has already started work on a 45-story residential tower at its massive Government Center Garage project, which the company has branded as Bulfinch Crossing. HYM’s managing director, Tom O’Brien, said the lease with State Street enables his company to get started on the office tower, the second phase of Bulfinch Crossing. It ensures the building can be financed and completed by the end of 2022 and should help persuade other potential tenants to consider moving there. “This is really a wonderful opportunity to move the project forward,” O’Brien said. HYM will pare back the part of the garage that spans Congress Street like a parked spaceship, opening that stretch of the street to the sky. The garage has about 2,300 spaces today. By the time the project is done, fewer than half will remain. The move is the latest in a string of big leases that have launched construction of large office buildings in and around Boston, from Amazon’s 430,000-square-foot lease in the Seaport to Sanofi’s deal for two new buildings at Cambridge Crossing to Verizon, which will anchor a new office tower now underway on Canal Street at North Station. These deals are being driven, in part, by a shortage of large blocks of space in existing buildings. Just one building in central Boston — at 601 Congress St. in the Seaport — has 500,000 square feet available to rent right now, and brokers expect that it will be filled well before State Street is ready to move. That scarcity is driving big tenants to look at new construction. And it has prompted some developers to consider building “on spec” – without a tenant – to better position their projects for companies that want a new home, fast. HYM is planning to start construction on One Congress by this summer. The developer secured financing in September from Carr Properties, which took a 50 percent stake in the roughly $1 billion project. Another D.C. firm, National Real Estate Advisors, will control the rest of the tower’s equity. At 528 feet, One Congress will be the tallest office tower built in Boston since One Financial Center opened near South Station in 1984, though Winthrop Center, on which construction has just begun, will be taller and will include both office space and condominiums. Jon Chesto can be reached at jon.chesto@globe.com. Follow him on Twitter @jonchesto. Tim Logan can be reached at tim.logan@globe.com.